What Is the Marangoni Effect? The Marangoni effect takes place when there is a gradient of surface tension at the interface between two phases – in most situations, a liquid-gas interface. The surface tension typically changes due to variations in solute concentration, surfactant concentration, and temperature variations along the interface. In some eutectics or multicomponent liquids, the direction of the gradient of surface tension tangential to the interface can be changed by altering the concentration of the solutes at the surface or by adding surfactants. Depending on the fluid, a rather strong convective motion may be produced. This results in a shear stress at the surface, similar to what the wind can create. In cases where the concentration drives the variation of the surface tension, the Marangoni effect is referred to as the solutocapillary effect. In cases where the surface tension varies with the temperature, the Marangoni effect is referred to as the thermocapillary effect. Both effects can take place simultaneously. Simulation in which heat is applied to a free surface. Isotherms, velocity arrows, and streamlines are displayed, illustrating the motion directed toward the outer cold boundary. This example describes the thermocapillary effect as it relates to temperature dependence. 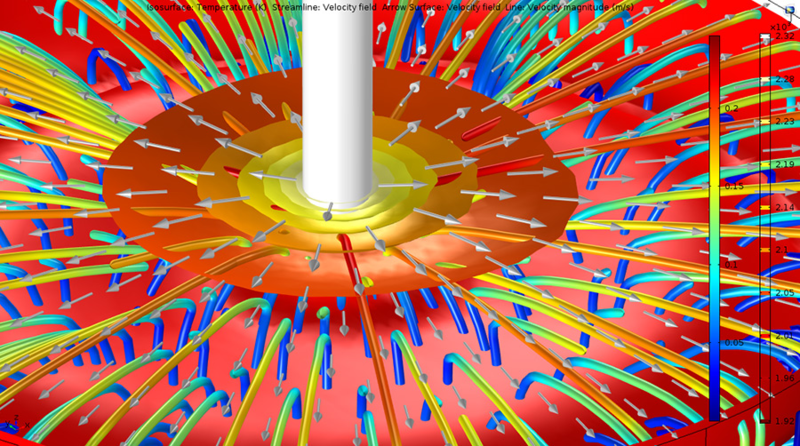 Simulation in which heat is applied to a free surface. Isotherms, velocity arrows, and streamlines are displayed, illustrating the motion directed toward the outer cold boundary. This example describes the thermocapillary effect as it relates to temperature dependence. Here, is the surface tension in N/m, is the density of the fluid forming the droplet in kg/m3, and is the gravity in m2/s. In water, = 72.8e-3 N/m at 20°C. The capillary length is thus within the range of 2 to 3 mm for water. This provides a good estimate for the diameter of a water droplet that is simply at rest on a table. Above this dimension, gravity becomes more and more predominant. Below this dimension, capillary forces are often much greater than the effects of gravity. All of this is true for an isothermal system. However, when a meniscus is present and a solute evaporates from the liquid surface (e.g., ethanol in a water solution), gradients in concentration may occur along the surface of the liquid. The reason for these gradients is that the evaporating solute is replaced more quickly at the flat surface compared to the meniscus, since the solute transport from the bulk to the surface is faster at the flat interface. In a way, this connects capillary effects and the Marangoni effect. The alcohol concentration gradient, caused by differences in the transport rate of alcohol from the bulk to the flat surface and from the bulk to the meniscus, results in surface tension gradients and the formation of tears of wine. The alcohol concentration gradient, caused by differences in the transport rate of alcohol from the bulk to the flat surface and from the bulk to the meniscus, results in surface tension gradients and the formation of tears of wine. The Marangoni effect can take place at both ranges of dimensions – microfluidics and larger meter scales. What's important is the variation of the surface tension – for example, with respect to the temperature in the thermally induced Marangoni effect. The scale at which the thermally induced Marangoni effect is active relates to the temperature gradient in the direction tangential to the interface. with and denoting the temperature and concentration. is the thermal dependence of the surface tension in N/m/K. The absolute value is used so that the nondimensional Marangoni number remains positive. A similar definition applies to the composition dependence of the surface tension. As temperature differences increase, the Marangoni effect becomes more pronounced. As temperature differences increase, the Marangoni effect becomes more pronounced. This is a boundary condition that acts at the free surface of the fluid (typically a gas-liquid interface) modeled with the Navier-Stokes equations. The Marangoni number is the nondimensional number that gives the ratio between the thermocapillary effect and the viscous forces. is the the length scale of the system in m, is the maximum temperature difference across the system in K, is the dynamic viscosity in kg/s/m, and is the thermal diffusivity in m2/s. where is the kinematic viscosity in m2/s. Written in this format, there is an analogy with the Rayleigh number that is relevant for conjugate heat transfer due to Archimedes' forces. The typical velocities involved are the thermocapillary velocity , the thermal diffusion velocity , and the molecular diffusion velocity . is the Prandtl number, which is characteristic of the fluid of interest. As is the case with the Reynolds number, typical orders of magnitude for flow characterization with the Marangoni number depend greatly on the geometry. However, a Marangoni number above 1·105 will typically develop unsteady flows, if not turbulent. First noted in the phenomenon of tears of wine, the Marangoni effect has been observed in various surface chemistry and fluid flow processes. Welding is a fabrication process where the Marangoni effect has to be accounted for. When the base metal during welding reaches its melting point, a weld pool forms. Marangoni forces within these pools can affect the flow and temperature distribution and modify the molten pool extension. This can potentially result in stresses within the material as well as deformation. Semiconductors are usually comprised of crystal lattice structures. The processes for developing pure crystals (e.g., silicon) consist of purifying the metal, which begins with melting the solid. During purification, convection in the liquid phase must be allowed so that impurities like oxides, which are often lighter than metal, have time to separate. Additionally, heat transfer must be regulated so that the shape of the solidification front is controlled. Forces from the Marangoni effect can impact crystal growth, causing faults within the structure. These faults can inhibit the material's semiconducting capabilities and result in defects within the device. Using an electron beam as its power source, metal powder can be melted to manufacture mechanical parts. This method of additive manufacturing has gained popularity in the development of medical implants as well as the aerospace industry. During the melting process, large thermal gradients can generate Marangoni forces within the melt. Such forces have the potential to negatively affect the quality of the material. Related What Is Mass Transfer?